888Poker has been celebrating the Northern Hemisphere summer in style, running the Summer SplashOut promo since the middle of July. As all good things must come to an end, the promotion is drawing a to close on the 2nd of September but you’ve still got a couple of days to head on over and sign up at 888Poker to take advantage of these awesome offers. Register for a new account at www.888Poker.com between July 14th and September 2nd and you’ll be rewarded with four entry tickets to selected poker tournaments. 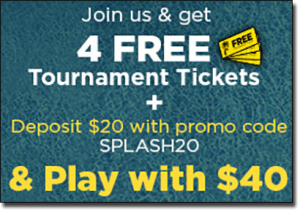 The tickets can be used on either the SplashOut Free tournaments or the All-in SplashOut Goodies tournaments, with tourneys happening around the clock 12 times daily. There’s up to $12,000 in cold hard cash and red hot goodies to be won in these tournaments every day with no damage to your own pocket, giving seasoned poker players and newbies alike the chance to hone their poker skills and enjoy the thrill of the competitive nature of tourney play. During the promotional period, enter the code ‘SPLASH20’ when making your first deposit of $20 or more and 888Poker will also match it with an extra $20. This is on top of the usual no-deposit welcome package of $88, so depositing as little as $20 before the 2nd of September can get you up to $108 of free money to kick off your online poker experience. 888Poker is one of the Internet’s leading real money poker sites and is a real hit amongst international players. Games are also available for mobile play on iOS and Android smartphones and tablets so however you like to play, head to 888poker and sign up for an account today.